Another area of London to explore and experience. Click back to Touring London. Get the royal treatment on this full-day London Super Saver, combining two tours at a discounted price. Enjoy early access to the Tower of London and enter before the crowds, then see London landmarks including St Paul's Cathedral and the London Eye on a Thames River cruise. 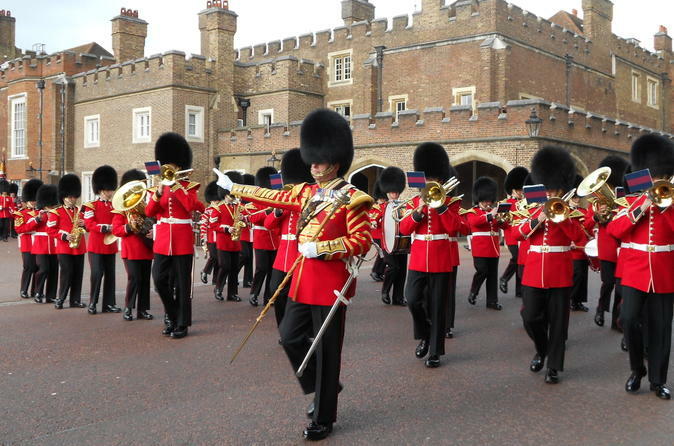 Watch the Changing of the Guards at Buckingham Palace or Horse Guards Parade. After two hours of free time, enjoy a walking tour through Trafalgar Square, Whitehall and Parliament Square, then finish up with afternoon tea at a prestigious central hotel. Exploring the physical center of London can be done on foot in about an hour starting at Trafalgar Square, walking the Mall to Buckingham Palace, then taking Spur Road to Birdcage Walk at the south of St. James's Park to the Houses of Parliament and Westminster Abbey. Enclosed in "The Royal Triangle" defined by Trafalgar Square, Buckingham Palace, and Westminster Abbey are many of London's most popular attractions, architectural icons and sights. Admission is free for the Web site attractions listed in Red below. Admiralty Arch, is the Gateway to the Mall, at the southwest corner of Trafalgar Square that runs through St. James Park to Buckingham Palace. A great promenade and the venue for the Queen's summer parties. Buckingham Palace, one of the Queen's residences. 10 Downing Street, Whitehall, the Prime Ministers residence. Queen's Gallery, Buckingham Palace Road, south of the Palace, a small gallery with rotating exhibitions giving a taste of the art in The Royal Collection. Horse Guards, Whitehall, Horse Guards Road. A great photo opportunity. Institute of the Contemporary Arts, theatre, dance, visual arts and musical performances. The National Gallery, Trafalgar Square, houses one of the greatest collections of European painting in the world. National Portrait Gallery, St Martin's Place. Their collection of the likenesses of famous British men and women is unrivaled. St. Martin-in-the-Fields, one of Britain's best known and loved churches. Tate Britain with its collection of British Art past and present. Trafalgar Square, at the center of London, is marked by Nelson's Column, one of the city's well worn icons. Westminster Abbey the place of royal worship and pagentry.